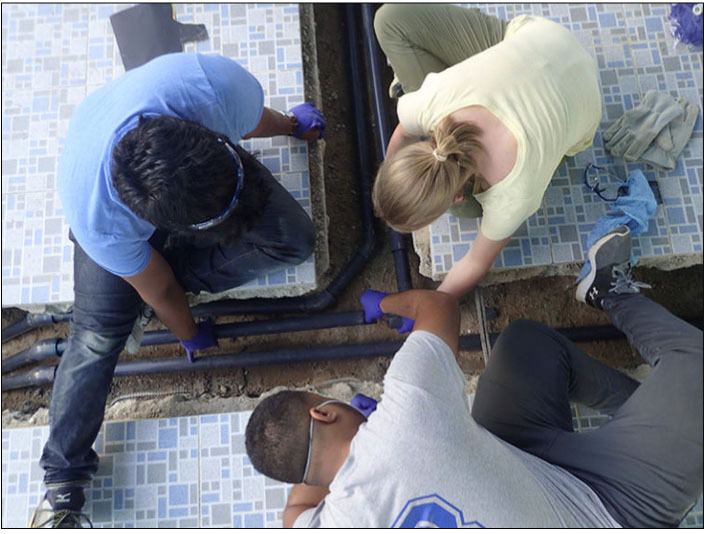 Members of the Engineers Without Borders chapter install a water piping system to provide clean drinking water for a school in the Dominican Republic. Many Hajim School students don’t wait to graduate to start tackling the world’s grand engineering challenges. They volunteer on winter breaks to help bring safe drinking water to villagers in underdeveloped countries, for example. They spend summers doing mentored research projects to diversify the supply of biofuels or improve the efficiency of batteries. They launch fund-raising campaigns, and even their own start-up companies to address pressing human needs, here and abroad. Now these students will have a chance to earn extra recognition as NAE Grand Challenges Scholars. The Hajim School recently joined more than 40 other engineering schools that participate in the National Academy of Engineering program, which is aimed at educating a new generation of engineers to tackle 14 Grand Challenges for Engineering in the 21st Century..
Hajim School students who successfully combine research, community engaged learning, internships, and global experiences to address one of those issues, will receive a medal and will be listed at the NAE Grand Challenge Scholars website. “This is a great opportunity for students to proactively take ownership of their learning experience here,” says Wendi Heinzelman, dean of the Hajim School. Heinzelman stressed that this will not be a GPA-based honors program, though students will have to maintain good academic standing to participate. “This is for students who want to make more of their education than just going to class,” she says. The program will be administered by Lisa Norwood, assistant dean of undergraduate studies. She will head a steering committee comprised of one faculty member from each department and Alvin Lomibao, assistant director of undergraduate programs. The committee will help review the work of participating students and certify those who successfully meet the requirements. Heinzelman says she hopes the school’s NAE Scholars will form their own organization to share experiences and recruit new students into the program. To further promote the program, NAE Scholars will have an opportunity to present posters or talks at the AS&E spring Research Symposium. 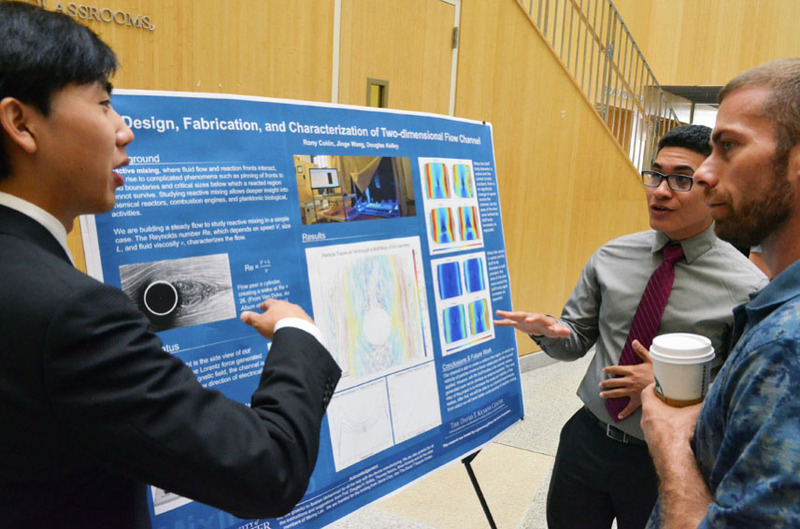 Xerox Engineering Research Fellows Ronnie Colon and Jinge Wang set up a chamber to study the mechanics of how fluids flow around an obstacle, and the potential for reactive mixing in the “wake” zone behind it. This could help explain blooms of plankton behind islands and have applications for carbon sequestration and enhanced oil recovery.